Jazzics! is the new album of Matangi Quartet and is an ode to jazz from a classical point of view. 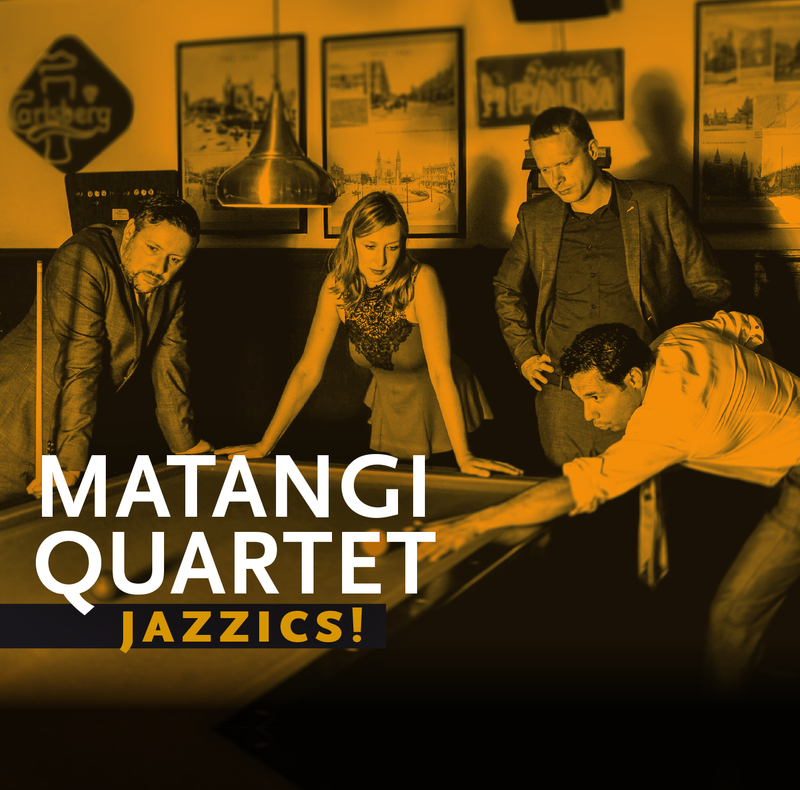 After years of collaboration with a wide variety of jazz-greats such as Eric Vloeimans, Wolfert Brederode and Michiel Braam, these collaborations have inspired and challenged Matangi to develop musically, both as individual musicians and as a quartet. With compositions of Chick Corea, Martin Fondse, Michiel Braam and Wolfert Brederode, this classical string quartet enters the spotlights of the jazz scene! ‘The Adventures of Hippocrates’ is a suite of five movements, expressive and rhythmical with influences from jazz and latin-american music which will take you by the hand and lead you through the wonderful world of Chick Corea. Corea summarizes the five movements as tango, waltz, ballad, rock feel and a finale with a “swiftly moving” tempo. The complex piece ‘Facing Death’ by Louis Andriessen is based on the idea that Charlie Parker had to play so many notes in such a short time because he knew he would die young. Bebop solos for string quartet, the alternating soundscapes and rhythmical features that unite at the end make this piece a challenge for every string quartet. Michiel Braam wrote ‘Black to White’ especially for the Jazzics! album. After working and recording with Michiel during his successful tour with the Hybrid Tentet, we asked him to write a piece for the four of us. His “out-of-the-box” way of composing, makes his music an essential addition to this album. A few years ago, Martin Fondse wrote an amazing piece called ‘Testimoni’ for trumpeter Eric Vloeimans and the Matangi Quartet. The album Testimoni was rewarded with the highest Dutch jazz-album price, the Edison Jazz. Playing more and more with Martin, we thought it was time to ask him for a piece just for string quartet. We are very happy he agreed and finished this breathtaking piece just in time for the recording. Ralph Rousseau wins Edison Audience Award! ""In addition to passages that the members chose themselves, you can hear the respect for the work of the composers""
""The quartet provides excellent and catchy interpretations""